Does Burger King still give out those paper crowns? Wear one of those while you're driving. F'ing trolls are everywhere man...it's a damn epidemic. Just gotta ignore them. Subscribed to this awesome thread. Be VERY careful with Chris Barrys AC kit. The bracket allows the stock Rover AC compressor to be used, which is all fine and well, but it uses a TINY daihatsu charade alternator, i think its around 45 amps, IMO no way NEAR enough to drive even a stock engine. The stock alternator on the k20 is 100amps. Now, I am an electrical engineer for an automotive OEM, and 45amps is stupidly small, you will be running on the limit by simply switching on the headlamps and if i remember doing my calculations if you had the high beams switched on; the battery would no longer be charging. This is on a stock engine stock chassis setup. Good to know. I will find out how much alternator can fit with his kit. As it stands I haven't ordered it yet. Do you know of any other options? I may end up just figuring out some solution myself. Considering I am going to be running four 300lph+ lph fuel pumps, pumps for the air/water, and an aftermarket head unit and sound system, HIDs and probably some other stuff that uses more juice than stock I don't think 45a would get me very far. 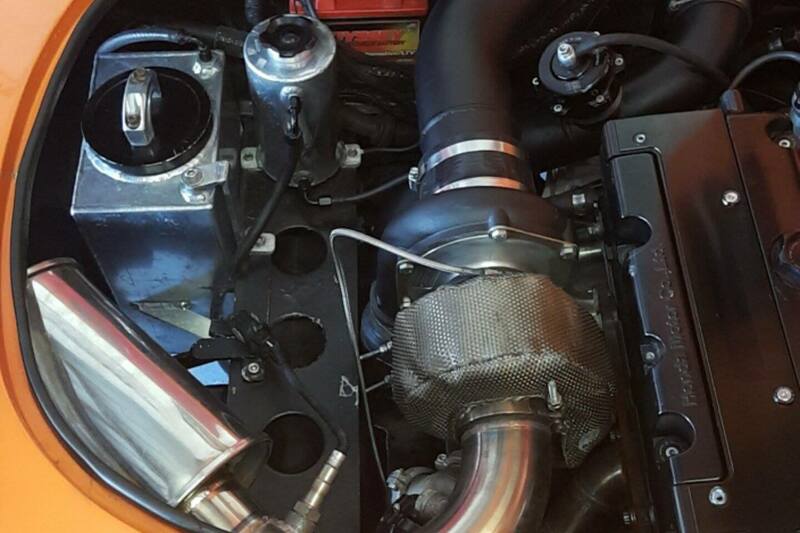 To be honest, the AC compressor idea is actually very simple, it basically mounts the AC comp directly in place of the alternator just using a simple H pattern bracket to adapt the different bolt pattern, and uses a couple of small arms to hold the new alternator down stairs next to the sump. IMO i would just live without the AC. Also, forgot to mention the daihatsu alternator is a couple of ribs smaller on the belt, another thing I did not agree with but its not so bad (I was worried about running superchargers). Clutch: You can play around your whole life with high load twin disks than put so much load on the crank that you spit out the thrust bearings (I've been there with multiple clutches, including the clutch master). Or you can bite the bullet and get a carbon / carbon twin disk with stock pedal pressure and 840 lbs torque rating. I've had zero problems with my Tilton in 8 years. Beware clutch manufacturers who don't know torque from power. AC: The standard compressors works. There is a very simple top bracket and a reasonable bottom bracket. Once I get access to the drawings for my engine I will post them. Alternator: See above. Keep stock alternator. Certainly interested in your drawings for the brackets. If the solution fits for my implementation I will have them or something similar fabbed. Carbonetics was possibly next step but the clutch masters is feeling OK. Competition clutch was a leg breaker. Did you have some problem with the clutch master twin disc specifically? Last edited by dallasreed; 08-07-2015 at 07:13 PM. Nice build, thing will scoot. In for updates! Looks like from your advice and some looking on the k20a forum spring pressure on the clutch pushes the crank into the thrust bearings and grinds the crank. Looking over the k20a forums it appears this has happened to a few people there as well. Appears proper adjustment of the clutch master cylinder and pedal are a big deal in preventing this issue, and a clutch stop would be a very good idea also. I guess you adjusted everything and still had issue? It's just that the crank trust bearing is small, and it just can't cope large amounts of end thrust on the crank. The pedal adjustment is only an issue if the clutch release is bottoming out, which you can normally feel as the springs go over center. The #1 thing to do is to disable any clutch interlock and never crank the engine with the clutch disengaged (ie pedal down). If the thrust bearing is overloaded then cranking with zero oil pressure is going to make it really, really, unhappy. In my opinion any clutch interlock should not allow cranking unless the clutch is up (not down), but the lawyers don't see it that way. My Elise didn't have an interlock - I think only Canada models did. As far a clutches go, the Exedy Hyper Single handles about 4 time the torque that Exedy claims. From there the Tilton twin plates are good, but the Tilton carbon/carbon is the best (rated at 840 ft lbs, available in 540 ft lbs too). I like Tilton C-C clutches. Every few years, I look at their drawings of a 5.5" triple CC clutch and call them to see, if it will fit into a K20 bellhousing.... It does not! I got an ATS clutch and adapted a Tilton hydraulic throw-out bearing. Took some playing with piston length... Based on ATS clutch and the extra long piston I had to get, there should be room for a 5.5" triple!!! CC clutches are the greatest. Tuning is done. 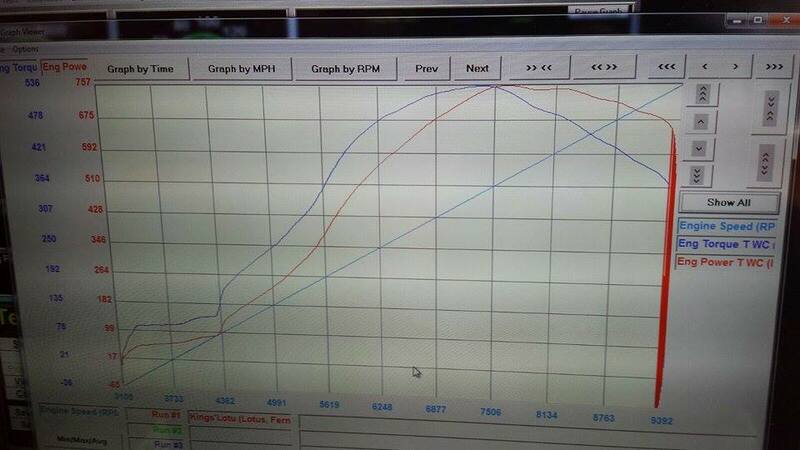 Here is a kill mode dyno plot. Last edited by dallasreed; 08-12-2015 at 10:15 AM.